Armenia is a country that remains relatively untouched by the commercialization of tourism. Proud of its unique cultural heritage, Armenia offers over 4,000 historical monuments and churches. This tiny country has the third richest collection of art in the former Soviet Union and shoppers will delight in Yerevan’s markets for carpets, gold, silver and carvings. Georgia is home to some of the most glorious landscapes anywhere in Eurasia. The high snow-capped Caucasus Mountains descend to the subtropical Black Sea coast; fertile valleys and gushing rivers give way to dramatic semi-desert. Tbilisi, the capital, is an intriguing mix of severe Soviet style and the exotic. Azerbaijan is one of the most ancient sites of humankind - present here at every stage of their historical development. With more than 6,000 historical sites across the country, you never have to go far to experience much of what this fascinating country has to offer. 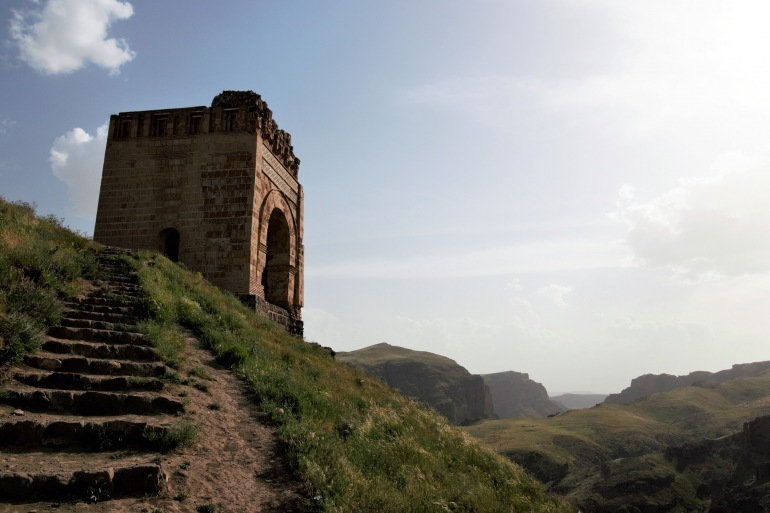 Not to be missed is the unique museum-reservation "Gobustan" or the fire worshippers temple, "Atashgah." Armenia, Azerbaijan and Georgia – all post-Soviet states – are often overlooked travel gems; discover their rich cultures on this tour. No reviews yet for this trip. Browse other reviews below for Exeter International . Upon arrival in Baku, your guide will be waiting for you just outside of baggage claim and customs to transfer you to your hotel. You will be staying in one of the most beautiful hotels in Europe, the stunning and brand new Four Seasons Hotel Baku. With just 177 rooms and suites, the Four Seasons is perfectly located at the edge of Old Town and directly on the Caspian Sea. You’ll be in the center of everything for the next three days. This afternoon, your guide will take you to the History Museum of Azerbaijan (closed on Sunday), a former palace belonging to one of Baku’s wealthiest and most famous citizens, Mr. Zeynalabdin Taghiyev, in the late 19th century. The rooms of the palace are unexpectedly opulent: a mix of Western and Eastern décor that is truly unique. Beyond the palace rooms is a wonderful museum that traces Azeri history from Neolithic times to the Russian Empire, the era of the Soviet Union through to today. This is a museum not to be missed. Later, your guide will take you to what is perhaps the greatest carpet collection and museum in the world. The Old Town, a UNESCO World Heritage Site, is one of the oldest continuously inhabited parts in the region – and indeed in the Middle East. Archaeological digs have revealed Bronze Age burial chambers, dating Baku to over 1,500 years old. This is the most popular area of the city, a maze of alleys, dead ends and caravanserais sometimes called the “Acropolis of Baku”. You’ll see carpet shops and cafes and you shouldn’t miss a stop into a tea house to sample hot lavash bread pulled straight from the clay oven just as you enter. This afternoon, your guide will take you to the Walled City of Baku and the Shirvanshah’s Palace. The walls you see are well preserved and date from the 12th century and the Palace was built in the 15th century. While much of the treasures that were once the pride of Baku were taken by the Ottomans to Istanbul, you can still feel the history of the palace when wandering from the residential areas to the baths, through the mosque and beyond. Here in Old Town, you’ll also see the Maiden Tower and can climb to the top for a wonderful panoramic view of the historic neighborhood. Early this evening, you may enjoy a boat tour in Baku’s perfect harbor and take in the city from the water. next to the famous Mud Volcanoes of Azerbaijan to witness the hot mud that flows like lava from this fascinating geological wonder. Enjoy a private visit to the former house of the Nobel family. Ludwig, Robert and Emmanuel Nobel moved from St Petersburg to Baku in the 1870s, originally to develop business in wood. The first industrial output of oil in the world was in Baku in 1848 - five years before Pennsylvania. The Nobel brothers ended up in the oil business and they became the catalyst for the Russian tsar to decree that the development of oil was no longer a monopoly, and so the first oil boom started. For many years the villa was totally dilapidated, home to pigeons and cats. In 2002 an application was made to restore the mansion, and this became reality in 2005. Two years later the building was reopened, now a house museum devoted to the history of the brothers and the development of the world’s oil business. It is now also home to the Baku Nobel Oil Club. In the last three years, 14 Nobel laureates have visited, together with many descendants of the Nobel family. A visit to the villa brings the vibrant history to fascinating life. Evening boat cruise on the Caspian Sea to view Baku from a totally different perspective. This morning, your guide will take you to visit the fascinating burning hill fueled by natural gas escaping from the rocks and earth. This area is endlessly burning for decades, flames sprouting from the earth almost beneath your feet. Next you can visit Ateshgah Temple, also known as the Temple of the Fire Worshippers, which has been a center of worship for thousands of years. This temple, built by Zoroastrian fire-worshipers traveling from India and Persia, is one of the finest preserved temples of its kind and is soon to become a UNESCO World Heritage site. You are unlikely to see anything else like this majestic temple outside of India. The temple is built on the site of a natural gas vent believed to have been sacred to the Zoroastrians since the 6th century. To get a sense of how the worshippers lived you can visit the inside museum and discover the ritual required to have your wishes granted. The shapes of the temple might seem familiar to you after your visit to the Nobel Mansion; the brothers used it in their logo for the Nobel Oil Company. The area is so saturated with natural gas and oil that flames spontaneously erupt from the ground - hence the country’s other name, Odlar Yourdu, or “Land of Fires”, and the name of the temple, which means “Home of Fire”. Much of the existing structure has been built since the 17th century, when pilgrims began paying local officials for permission to construct places to pray and sleep. Return to the city center, where we’d recommend a visit to the Bazaar (market) to see the famous Baku tomatoes, citrus and nuts, sold as they have been for centuries by local traders. If time allows this morning, you might want to see the Azerbaijan Art Museum (closed Sunday), housed in the Rothschild family mansion in the city center. This fine collection is particularly strong in Russian paintings, including Aivazovsky, Repin, and Kandinsky, three of the greatest. Transfer to the airport and flight onward.